With the final preparations for the launch of Royal Caribbean’s newest ship, Anthem of the Seas, being completed – the ship is currently being named in homeport, Southampton. Godmother, Emma Wilby, is set to name the ship this afternoon after performing a special song in front of 1,300 special guests. “We are delighted to welcome Emma Wilby into the Royal Caribbean family as Anthem of the Seas’ Godmother. Emma is among many submissions from truly talented travel agents across the UK and the judging was very difficult. With glorious sun and soaring temperatures in Southampton, it has proven to be a beautiful day for the Anthem of the Seas to be entered into service. The ship is lined up to set off on her maiden voyage on Wednesday (22 April) for a week-long voyage around France and Spain, visiting Vigo, Bilbao and Paris before returning to Southampton. 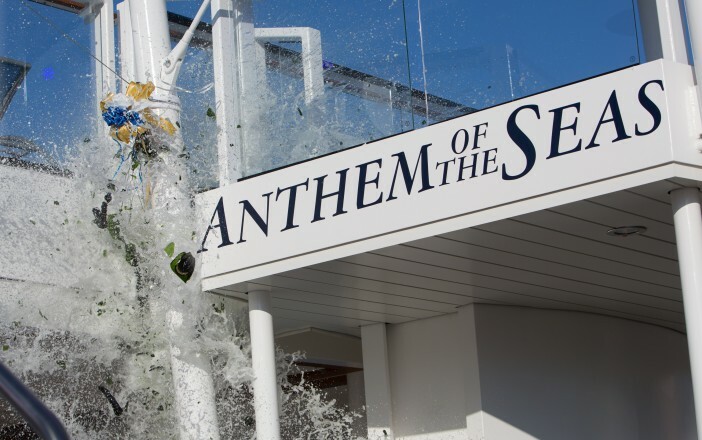 Then Anthem will become a common sight in Southampton over the next six months as it calls the south coast city home until repositioning to the other side of the Atlantic in New Jersey in October. Since being first announced in 2012, the Anthem is now incredibly close to her first voyage, ending a long wait for Royal Caribbean fans. With the final preparations for the launch of Royal Caribbean’s newest ship, Anthem of the Seas, being completed – the ship is currently being named in homeport, Southampton.